Author Todd James Pierce has taken fans of amusement park history to places never been seen before. 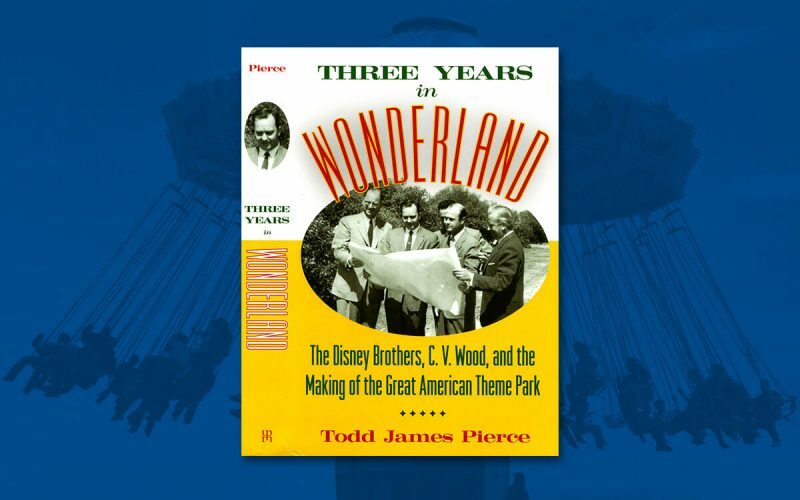 The extended title of the book: Three Years in Wonderland: The Disney Brothers, C.V. Wood, and the Making of the Great American Theme Park tells of the origins of the Anaheim theme park as others have briefly touched upon, but never before detailed with such research, perspective and grit. Upon completion of the book, the reader sits back to almost take a breath and realizes that Disneyland should not only probably never have been built, but was astonishing it ever opened and lasted for more than a few months. There are some unusual characteristics to the book compared to other Disney homages. There are no pictures. The subjects are both revered, yet highly criticized. Chapter One is titled: How the Story Ends. Those that pick up the book will quickly understand this isn’t something they’ve seen before. The history quickly pulls one in, and the reader, who fully knows that Disneyland has now been an enormous success for six decades, still experiences that anguish of suspense. The first chapter sets the stage like a well-crafted mystery. C.V. Wood is nowhere to be found in Disneyland history, yet he was the first general manager, and his involvement in Disneyland’s origins was clearly vital. Following his departure, C.V. Wood’s contributions are described by the author thusly: “Woody believed that Americans were drawn to spectacle.” But his work is mostly forgotten. Chapter Two traces Wood’s background — a hooligan as a youth, rambunctious in his college years, and one who learned the ability to charm an audience and the people he met. To reach lofty aspirations, Wood learned to twist facts or even downright fabricate them. What could have been a few-page summary instead vividly lets the reader enter the mindset of Wood and his determination balanced by his unscrupulous tendencies. The next chapter focuses on Walt Disney and how his inspiration and focus transferred from animation to the dream of an amusement park. Few believed in it, including his brother Roy. Disneyphiles will particularly enjoy peeking into Walt’s early visions of Mickey Mouse Park, which eventually evolved into Disneyland. As plans progressed, the eventual meeting of Walt Disney and C.V. Wood is recounted. The working arrangement between the two was never a friendly one deep down, but one where the two knew the other’s importance to the project. The following chapters vividly detail the frustration and ordeal of acquiring the land for Disneyland, as well as the financing. Interestingly, Wood helped to successfully overcome these obstacles, but not always by demonstrating the highest integrity. While the reader obviously knows the eventual outcome, one can’t help but be drawn into the uncertainty these key figures were experiencing during this pivotal period of amusement history. Author Todd James Pierce has masterfully taken the reader into each board room and construction site. Another chapter paints a story of the obstacles and woes during the construction of the park. At the time, they seemed virtually insurmountable. Internal fighting and hostile unions became problematic. The uphill battle preparing Disneyland for opening day — including a lack of money and rides that didn’t work properly — took its toll on everyone, starting with Walt. The fact that the park ever opened can only be summed up as a miracle. It is here that one gets a true sense of Walt Disney as a human being — with normal fears and disappointments — instead of a legendary icon placed upon a pedestal. The next to last chapter tells of opening day and the disaster it was. Streets were still being poured that very morning and crowd control became a problem with no solution. Press surrounding the event was harsh. In the days and weeks that followed, things slowly fell into place. Regardless of the initial bad press, the public still seemed intrigued with this idea of a theme park. The tale concludes with Wood’s eventual departure. The division between Walt’s ideals and Wood’s questionable methods could no longer be bridged. Although not detailed in this book, Wood would go on to lead other such projects taking what he learned from his three years at Disneyland. Amusement Today wholeheartedly recommends this book to those who even slightly consider themselves to be Disney fans, theme park buffs or anyone interested in the complete picture of the amusement industry. It’s hard to imagine a time when the public didn’t understand what a theme park was, but Pierce and Three Years in Wonderland take each of us there. It’s a shame there are no pictures to make details of the nine years of extensive interviews and archival research jump off the page visually. Three Years in Wonderland is printed by University Press of Missouri. The hardback retails for $30, but discounts are available via purchasing online through Amazon or Barnes & Noble. E-book format is also available.